Conversations about such issues as violence, guns, climate change, ethical behavior, fake news and social media seem to be getting louder and more vitriolic, with people more entrenched in their silos than ever before. Jennifer Thompson. Photo by Lee Choo. professor Jennifer Thompson has created a website that encourages visitors to consider whether they are “good” people and prompts them, using the foundation of Jewish ethics, to think through social problems and come up with solutions. The website, “Jewish Ethics Here and Now,” grew out of an online course on Jewish ethics that Thompson teaches at CSUN. As she and her students engaged in a number of lively discussions about contemporary issues using Jewish ethics scholarship as the foundation, she realized that regardless of one’s religious beliefs, the teachings provide a basis for talking about today’s volatile issues, Thompson said. Many of the ideas, Thompson said, cross religious boundaries and focus on individual behaviors and how to treat people — and the environment around us — with respect. “It’s a way of engaging with others about what can be volatile issues, such as gun control, in a more thoughtful way,” she said. Thompson said the many texts on the website reflect a rabbinic tradition of having more than one answer to a question. The goal of the website, she said, is to encourage visitors to think about the issues that seem to dominate society today, “and our responsibility as individuals for the other people around us. “We need to find ways to think through our responses in what can often turn into heated conversations, so that what we say is defensible and has integrity with the rest of our own beliefs,” Thompson said. She encouraged website visitors to take on an assignment she created for her students in which she challenged them to make some small change in their lives for one week to reduce their carbon footprint. Along with reading about and discussing Jewish ethical perspectives on climate change, the students reflected on how hard it was to make small changes in their own lives and how doing so impacted them personally. “Just being conscious of the actions you take every day and the impact those actions have can be transformative for some people,” Thompson said. The Maurice Amado endowed professorship in CSUN’s Jewish Studies Interdisciplinary Program was created in 2011 with the understanding that whoever holds the position would teach and engage in scholarship drawn from the heritage of Sephardic, Ashkenazic and other Jewish traditions. 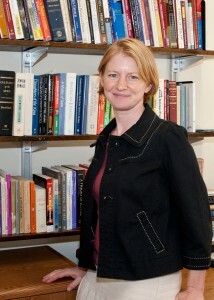 The Amado Professor also teaches courses that explore the Jewish ethical approach to communal and political challenges. Thompson said the website is a natural complement to the endowment’s goals, offering its visitors a way to thoughtfully explore the pressing issues that seem to dominate the airwaves today.